I am trying to use the :after CSS pseudo-element on an input field, but it does not work. If I use it with a span, it works OK. This does not work - it only colors someValue in red, but there is no smiley. What am I doing wrong? should I use another pseudo-selector? Note: I cannot add a span around my input, because it is being generated by a third-party control. :after and :before are not supported in Internet Explorer 7 and under, on any elements. It's also not meant to be used on replaced elements such as form elements (inputs) and image elements. In other words it's impossible with pure CSS. and <input> can not contain other elements. Pseudo-elements can only be defined (or better said are only supported) on container elements. Because the way they are rendered is within the container itself as a child element. input can not contain other elements hence they're not supported. A button on the other hand that's also a form element supports them, because it's a container of other sub-elements. See? an element's document tree content. As I understand it this means within a container. It's just type=text and some others that don't work. :before and :after are applied inside a container, which means you can use it for elements with an end tag. It doesn't apply for self-closing elements. I'm using this approach in AngularJS because it will add .ng-invalid classes automatically to <input> form elements, and to the form, but not to the <label>. I used the background-image to create the red dot for required fields. You can't put a pseudo element in an input element, but can put in shadow element, like a placeholder! To make it work in other browsers, use :-moz-placeholder, ::-moz-placeholder and :-ms-input-placeholder in different selectors. Can't group the selectors, because if a browser doesn't recognize the selector invalidates the entire statement. I found this post as I was having the same issue, this was the solution that worked for me. As opposed to replacing the input's value just remove it and absolutely position a span behind it that is the same size, the span can have a :before pseudo class applied to it with the icon font of your choice. The trick is to suppose there's a dom element after the text-field. Does'nt matter what it is (*), I use it. you have to hope no other input field follows your input field. But in most cases, we know our code so this solution seems efficient and 100% CSS and 0% jQuery. According to a note in the CSS 2.1 spec, the specification “does not fully define the interaction of :before and :after with replaced elements (such as IMG in HTML). This will be defined in more detail in a future specification.” Although input is not really a replaced element any more, the basic situation has not changed: the effect of :before and :after on it in unspecified and generally has no effect. The solution is to find a different approach to the problem you are trying to address this way. Putting generated content into a text input control would be very misleading: to the user, it would appear to be part of the initial value in the control, but it cannot be modified – so it would appear to be something forced at the start of the control, but yet it would not be submitted as part of form data. As others explained, inputs are kinda-replaced void elements, so most browsers won't allow you to generate ::before nor ::after pseudo-elements in them. However, the CSS Working Group is considering explicitly allowing ::before and ::after in case the input has appearance: none. Safari and Chrome both allow pseudo-elements on their form inputs. Other browsers don't. We looked into removing this, but the use-counter is recording ~.07% of pages using it, which is 20x our max removal threshold. Actually specifying pseudo-elements on inputs would require specifying the internal structure of inputs at least somewhat, which we haven't managed to do yet (and I'm not confident we *can* do). But Boris suggested, in one of the bugthreads, allowing it on appearance:none inputs - basically just turning them into <div>s, rather than "kinda-replaced" elements. 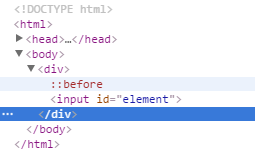 You have to have some kind of wrapper around the input to use a before or after pseudo-element. Here's a fiddle that has a before on the wrapper div of an input and then places the before inside the input - or at least it looks like it. Obviously, this is a work around but effective in a pinch and lends itself to being responsive. You can easily make this an after if you need to put some other content. If you are trying to style an input element with :before and :after, odds are you are trying to mimic the effects of other span, div, or even a elements in your CSS stack. As Robert Koritnik's answer points out, :before and :after can only be applied to container elements and input elements are not containers. HOWEVER, HTML 5 introduced the button element which is a container and behaves like an input[type="submit|reset"] element. It does not work with <input type="button">, but it works fine with <input type="checkbox">. :before and :after only works for nodes that can have child nodes since they insert a new node as the first or last node. The biggest misunderstanding here is the meaning of the words before and after. They do not refer to the element itself, but to the content in the element. So element:before is before the content, and element:after is after the content, but both are still inside the original element. The input element has no content in the CSS view, and so has no :before or :after pseudo content. This is true of many other void or replaced elements. There is no pseudo element referring to outside the element. In a different universe, these pseudo elements might have been called something else to make this distinction clearer. And someone might even have proposed a pseudo element which is genuinely outside the element. So far, this is not the case in this universe. You need to have a div parent that takes the padding and the :after. The first parent needs to be relative and the second div should be absolute so you can set the position of the after. Not the answer you're looking for? Browse other questions tagged html css pseudo-element css-content or ask your own question. :before :after not working on the input type submit? CSS: How can I add something before the value of an input? Can I change the height of an image in CSS :before/:after pseudo-elements? Why isn't it possible to combine vendor-specific pseudo-elements/classes into one rule set?